Blaze Obstacle Places First On App Charts! Keeping with tradition, Chewy Software's new Blaze game Hits the top of the app charts in it's intended categories! A quick check of the current app store charts today revealed that the recently released Blaze and the Monster Machines: Obstacle Course Challenge game has hit the #1 spot in the Kids 5 & Under Paid Apps category on iTunes, as well as the #1 spot for Paid Educational Games on Google Play! Blaze Obstacle has also placed high in several other categories. On iTunes it reached #4 in Top Paid Kids Apps, #6 Top Paid Educational Apps, #7 overall Kids category, and quickly reached #22 in the Top Grossing category. On Google Play in addition to its #1 spot, it reached #2 Top Paid 5 & Under Apps, #4 Top Paid Education (Family) Apps, and #10 Top Paid Family Apps. On Amazon, Blaze is just one place shy of the top ten at #11 for Top Paid Kids Games. This doesn't come as too much of a surprise considering every Blaze game that Chewy Software has developed has not only hit the top of the charts, but has proven long term staying power. Every single one of the Chewy-developed Blaze games remain solidly in the top 100 highest grossing kids games, and in the top 50 kids paid apps, which is extra impressive when you take into consideration Chewy's original Blaze and the Monster Machines game has retained an unwavering spot on the charts since 2014! An All New Blaze Game Is Out In App Stores Now! 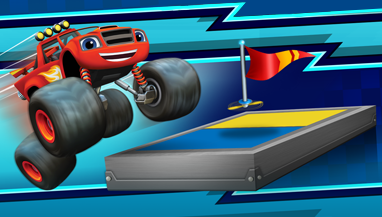 Chewy Software and Nick Jr. bring you an ALL NEW Blaze and the Monster Machines game with Obstacle Course Challenge! The new Blaze and the Monster Machines: Obstacle Course Challenge game puts a fresh new spin on monster truck racing and STEM education! Blaze and AJ must navigate a jungle obstacle course through land, air, water surface, and underwater. It'll be tricky with Crusher up to his old cheating antics of using crazy contraptions to try and keep Blaze from winning, but with the power to choose from more Blaze transformations than ever before (Gorilla, Laser, Speedboat, Falcon, Shark, and more!!) you can help Blaze complete the obstacle course and win the day! OBSTACLE COURSE CHALLENGE ACCEPTED! 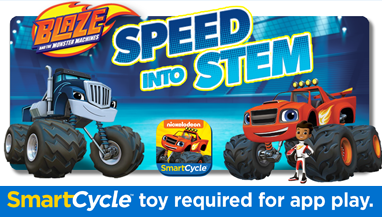 Blaze Speeds Into STEM For Fisher-Price Smart Cycle! The new Chewy Software Blaze game is released as a launch title exclusive for the Fisher-Price Think & Learn Smart Cycle! 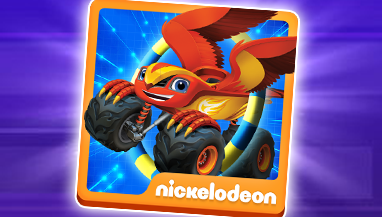 Available now for download, Nickelodeon's Blaze and the Monster Machines Speed Into STEM app is an exclusive game for use with the just released Fisher-Price Think & Learn Smart Cycle. Kids can rev up and roll out to explore the world of Blaze and the Monster Machines, pedaling their way to learning valuable STEM lessons like physics concepts, simple mechanics, spacial relations, problem solving, size and sequencing, all through the fun activities of driving, racing, and gaming! Chewy Software's new Blaze game, Speed Into STEM, is one of three Nickelodeon apps and a definite must-have for any Smart Cycle owner. So download the game, hop on your Smart Cycle, and LET'S BLAZE! Fisher-Price Think & Learn Smart Cycle Available Now! Now kids can pedal into learning fun with the Fisher-Price Think & Learn Smart Cycle and its exciting new apps! 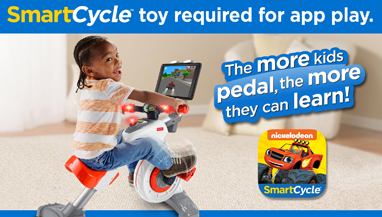 With the Think & Learn Smart Cycle from Fisher-Price, preschoolers can learn important skills they'll need as they head into kindergarten, all while they pedal through exciting games and learning adventures played right on a tablet or television! This immersive play experience makes learning fun AND active. Right from the start kids can play games to learn letters and Phonics, spelling and vocabulary, or reading and rhyming! Does pedaling, steering and playing their way to becoming readers sound like fun? It is!, and it's also setting up a foundation for inspiring little learners to be big thinkers! But the active learning fun doesn't stop there! Download additional Smart Cycle apps featuring characters from some of your child's favorite Nickelodeon shows, for even more high-speed learning fun focusing on different subjects, like Chewy Software's Blaze and the Monster Machines Speed Into STEM game! Smart Cycle allows kids to learn at their own pace. The exciting games teach different subjects with multiple levels of play that automatically adjust as your child learns. As they pedal to interact with the games and move the on-screen action along, they’ll give their minds AND bodies an A+ workout. The more kids pedal, the more they can learn! 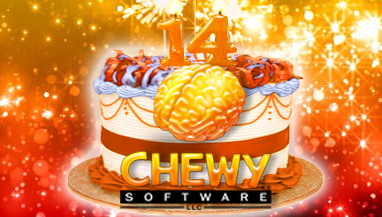 Chewy Software Celebrates It's 14th Birthday! This special day reminds us how quickly time flies and before you know it, our little software company isn't a startup anymore. Knowing that Chewy was a little shy and humble, the initial announcement of its second year grown beyond the "tween" age category was quiet and reserved. However, hushed conspiratorial word of the birthday occasion spread around the Chewy family like wildfire, and the exuberant excitement of everyone built up into a delightful need to somehow recognize and celebrate another year in our adorable little Chewy's life. Yes, one more year of growing up under its belt, our sweet little baby Chewy is now a teenager! Sensing a shift in the atmosphere, Chewy looked up from its cell-phone and removed the music blaring earbuds to glance around at all the dedicated Chewy staff looking at the 14 year old company with pride. A collective Happy Birthday was shouted as the crowd began to close in on Chewy for pats on the back and birthday hugs. Shrugging away like a desperate trapped animal making its escape, Chewy ran to the top of the stairs shouting "OMG, you guys are so embarrassing!". Chewy immediately locked itself in its room, repeatedly refusing to come out with comments through the door like "Leave me alone!" "It's not a big deal or anything." "Birthday parties are for babies!" and "Ugggh!, You guys are so lame!". Undeterred, the Chewy family eventually coaxed Chewy out of the room and everyone enjoyed complimentary gourmet birthday doughnuts!